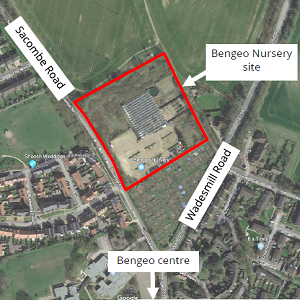 The public is being invited to an exhibition on the proposal of 50 homes on the Bengeo Nursery site, being held at the Bengeo Parish Church Hall, Duncombe Street, on Wednesday 25th July between 3pm and 8pm. Members of the development consultancy team will be on hand to welcome you, explain the scheme, listen to your views on the proposals and answer any queries you may have. The Sacombe Road site is identified as the first phase of a housing allocation in the emerging East Herts District Plan to deliver 50 houses by 2022, as part of a wider site intended to provide 150 homes overall. A planning application is currently being prepared for this first phase of 50 homes on the Bengeo Nursery site. The District Plan can be found here.